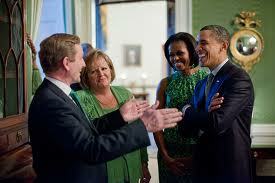 It is the most coveted ticket in Irish America, the invaluable access to the Obama White House for the annual St.Patrick’s Day event honoring the Irish Prime Minister. This year there are many disappointed faces. Many who have been invited in previous years, including some significant leaders in key re-election states, have been left empty-handed. It has caused no end of consternation and surprise, especially in an election year when a key constituency like Irish Americans is usually strongly courted. Indeed, key leaders in many leading organizations have had their stipend cut from two to one, leaving many spouses baffled after they had been on the guest list for several years. As any couple will tell you hell hath no fury like a spouse scorned and White House personnel have been hearing it hot and heavy over the past week from disappointed significant others. The culprit appears to be the President’s re-election committee who have bagged many of the Irish invites and shuffled them to big party backers who are only too glad to take part in a White House event, Irish or not. The upshot has been a similar occurrence to the very first year of the Obama White House in 2009 when old Chicago buddies and other key constituency leaders made it over stalwart Irish names. That caused such a firestorm that the following year it was Cead Mile Failte to one and all and it has been that way ever since-- until this year. There were murmurings this week when the British Prime Minister David Cameron had a state dinner in the usual St. Patrick’s slot at the White House. The fact that their joint op-ed in The New York Times did not even mention their joint success at helping solve the issue of Northern Ireland was also noticed. Ireland and Irish America it seems is relegated to the annual St.Patrick’s shindig, except now, with many being refused invites, even that may not be the case. It seems a trifle foolish given that Pennsylvania, Ohio and other key states all have large Irish Catholic constituencies which are key swing votes. The Obama folk should really pay more attention.